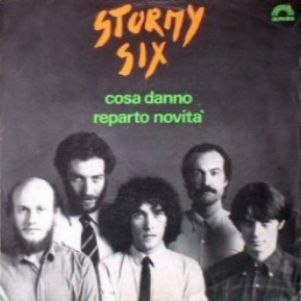 Their 1975 album Un biglietto del tram was the first proper original Stormy Six album, a highly rated album in Italy at the time and with strong political contents. 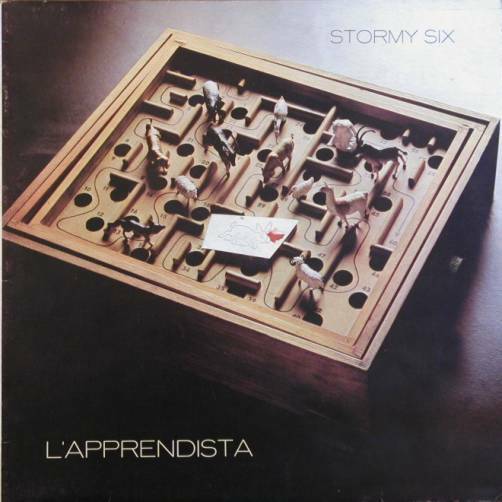 Released on the newly born independent label L'Orchestra (in which the band members had a leading role), it was a concept album, based on some events from the last years of World War II in Italy and the Resistance movement against nazis, the album contained an original blend of folk and prog sounds and interesting lyrics. 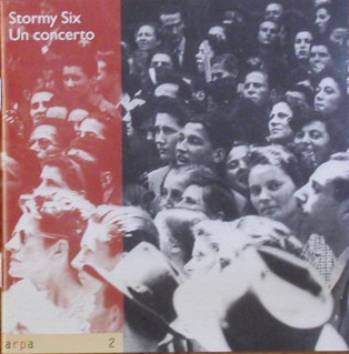 Songs like Stalingrado or Dante Di Nanni (the name of a victim of nazis) have always been in the band's concerts in later years. 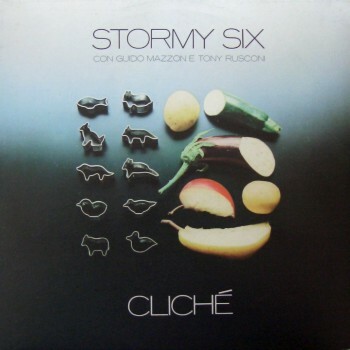 In 1976 a revised line-up produced the instrumental Cliché, conceived as a soundtrack for a theatre piece and with help from jazz players Guido Mazzon and Tony Rusconi, and a year later L'apprendista, one of their best works ever. A real prog gem, the album had complex rhythm changes in the best tradition of this style (some comparison are possible with Gentle Giant), yet retaining a very original mood, with a perfect use of any kind of instruments and multivocal parts. 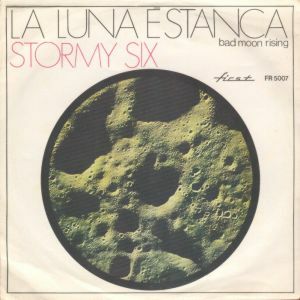 At the end of the 70's the band had prolific collaboration with foreign artists and Stormy Six were one of the five founder members (along with Henry Cow from UK, Univers Zero from Belgium, Etron Fou Leloublan from France and Samla Mammas Manna from Sweden) of the RIO-Rock In Opposition international movement, that gave them the opportunity to play all over Europe. 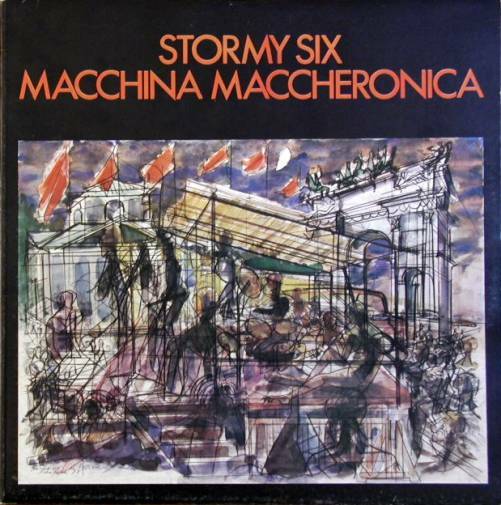 Next album in 1980, Macchina maccheronica, that also becomes the name of the band in some concerts, a varied album in the best RIO tradition with some very good tracks mixed with odd short songs and crazy rhythms, even a waltz! 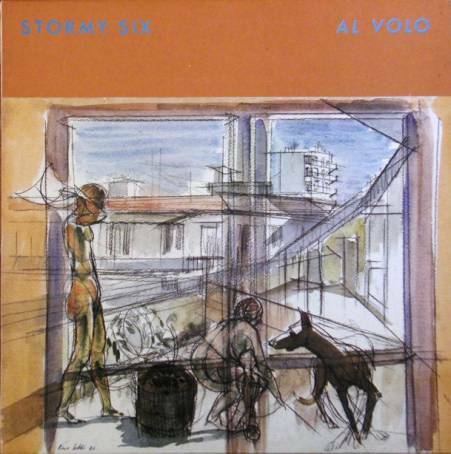 Last chapter in this long story Al volo, in 1982, still a good album that reveals 80's electropop influences added to the typical Stormy Six sound. In 1984 some of the band members also collaborated with German group Cassiber, releasing some recordings together with the name of Cassix on the English Recommended Records label. 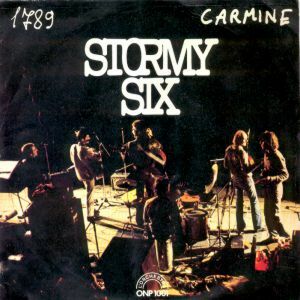 Cassix line-up included Umberto Fiori (vocals), Franco Fabbri (guitar), Heiner Goebbels (keyboards) Alfred Harth (sax), Pino Martini (bass), Chris Cutler (drums). Guitarist Franco Fabbri has written many books on music and had long collaborations with various avantgarde music and theatre groups, the others have had many other musical experiences after the band split. The band reunited in 1993 for a concert that's been released on the nice Un concerto CD. 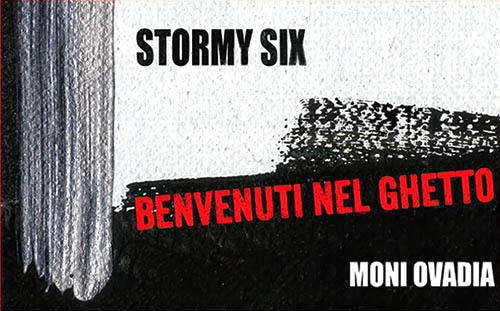 In the summer 2013 a new line-up of Stormy Six featuring Umberto Fiori, Tommaso Leddi, Salvatore Garau, Carlo de Martini along with Archimede De Martini (bass, violin) and Francesco Zago (guitars) represented a performance entitled Benvenuti nel ghetto, dedicated to the Warsaw ghetto uprising, with original music and the narrating voice of Moni Ovadia. A CD with DVD taken from this show has been issued at the end of the same year. 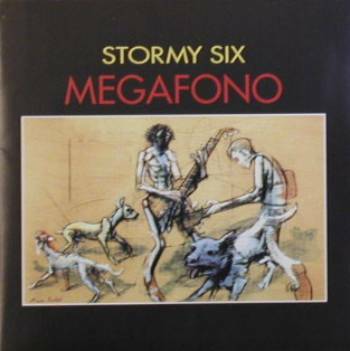 Benvenuti nel ghetto BTF/Vinyl Magic (VM 156CD) 2013 CD+DVD - mini-LP cover in rectangular slipcase - credited to "Stormy Six & Moni Ovadia"
also includes Picchio dal Pozzo. 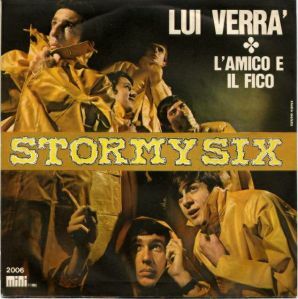 The Stormy Six track, Reparto novità, is the single version. 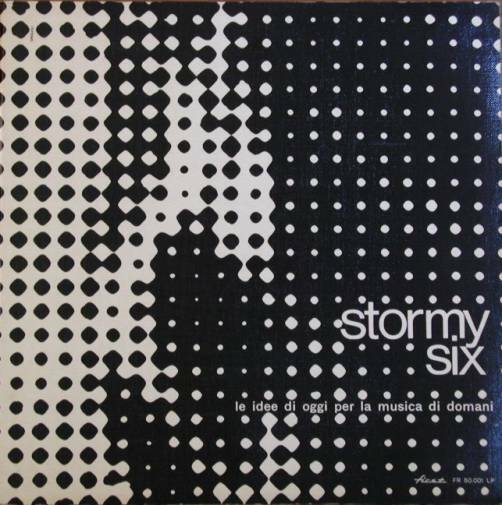 (with Coste, Religion, The Stanislavsky method, Tempo di pace, Bari, Copy machine, Finta di nulla) Recommended Records (Re 0103) - UK 1986 also featuring other artists' tracks. Cassix have seven short cuts. 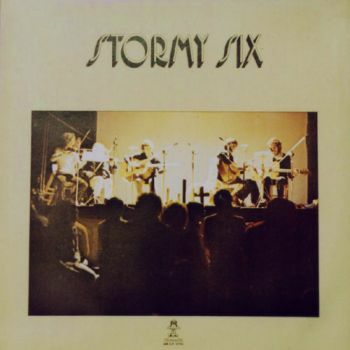 All the Stormy Six albums are rather common, except for their first three. 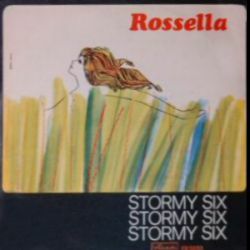 The albums by L'Orchestra were commonly also sold by bookshops and in political events during the 70's and have been released in large quantities. The first album Le idee di oggi per la musica di domani, is by far their rarest item; it was chosen to launch the short-lived Ariston "young" subsidiary First; as it was often the case with Ariston, it also came out on the head label at the same time or slightly later. Both issues had the same heavy gatefold sleeve with the First logo, some copies also carried a First logo sticker on the back cover. 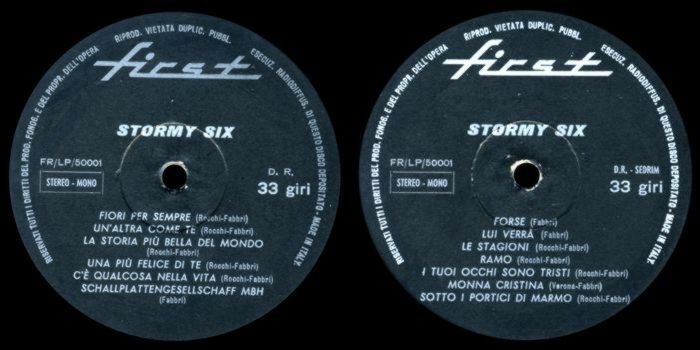 The album had all the tracks connected, and initially had no separation grooves on the vinyl, according to Franco Fabbri in his Album bianco book (see Books section for details), it was re-released with separated tracks to allow an easier airplay. 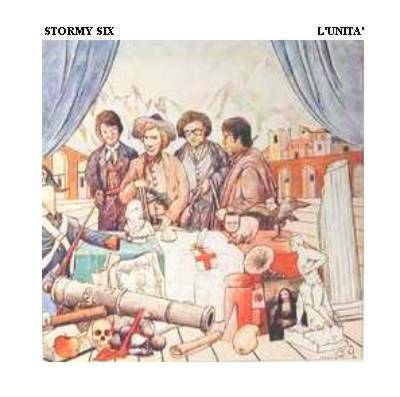 The standard edition of the record contains 13 tracks, but a different pressing, with 11 tracks in different order (without Forse and Schalplattengesellschaft mbh) was released in the same cover as the original (see picture below). 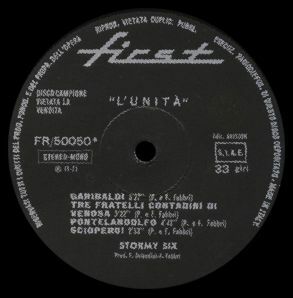 L'unità was first released with a gatefold cover on the First label, early copies came with the old black/silver label, soon replaced by the black/yellow 70's design. 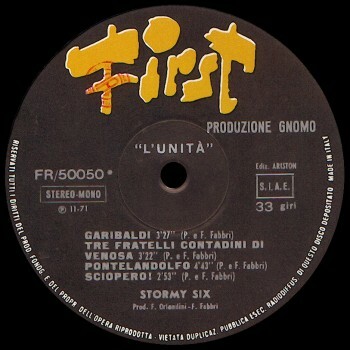 The new label also contained the "Produzione Gnomo" writing like the contemporary alternative releases on Ariston. A later issue on the Oxford budget price series had the same cover but was not gatefold. 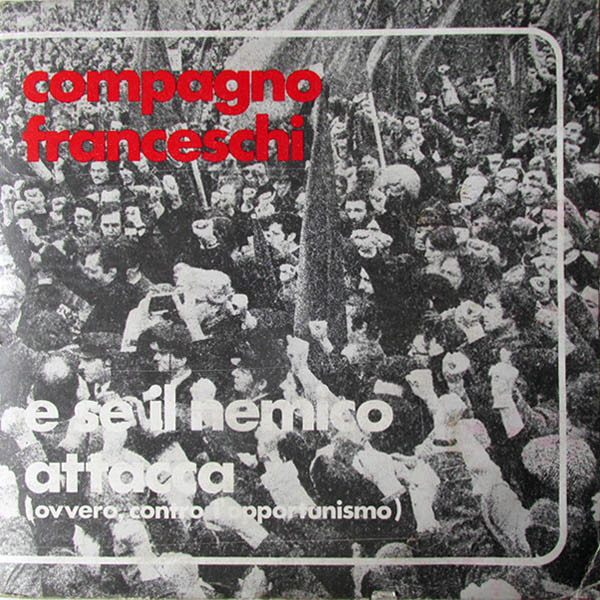 A track from this album, La manifestazione, was also included in the Al Festival Pop di Viareggio compilation in an different, longer version (it was originally a demo), featuring Eugenio Finardi and Alberto Camerini. 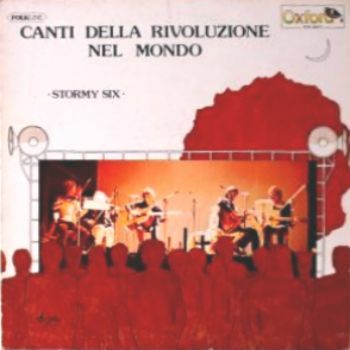 Guarda giù dalla pianura was reissued in a very popular second pressing with the new title Canti della rivoluzione del mondo on the Ariston Oxford low price series that is very easy to find. 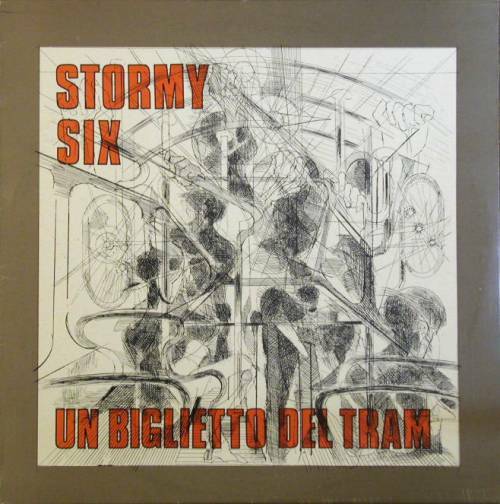 Un biglietto del tram, the first LP on L'Orchestra and probably their bestseller, was reissued many times, following the various changes in distribution that the label had. Originals had the side title in white letters and Ariston distribution credit on back cover. 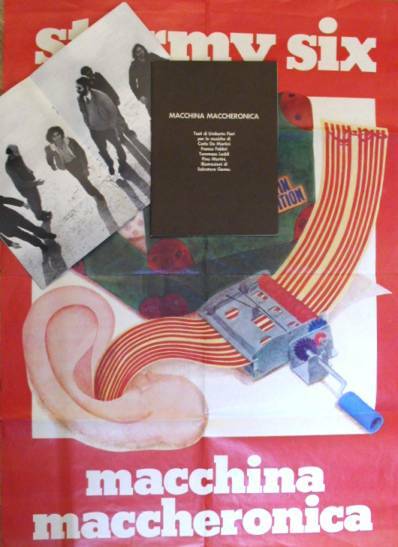 Macchina maccheronica contained an A5 16-page brown booklet with lyrics and drawings, and some early copies also contained a promotional tour poster. It was also sold in Germany (these were Italian imported copies, some had a distributor's sticker on the cover) with a second booklet (black cover - A5 format - 16 pages) with German lyric translation and different drawings plus a b/w picture of the band. An east German compilation on Amiga label (no. 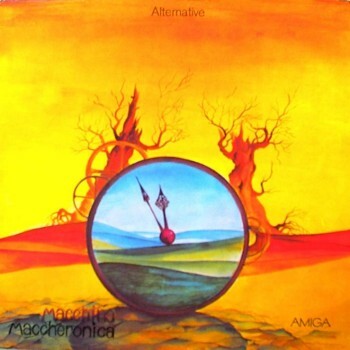 8 45 175), entitled Alternative was released in 1980, and was credited to the group Macchina Maccheronica. 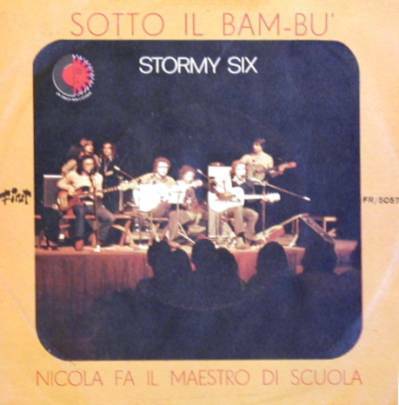 Among the Stormy Six rarities, a mention is deserved for a rare promotional EP released by PCI (Partito Comunista Italiano, Italian Communist Party) around 1972 and containing an unreleased track by the group, La Birindelleide, dedicated to Admiral Birindelli, who had become at the time a Member of Parliament in the right wing party MSI. 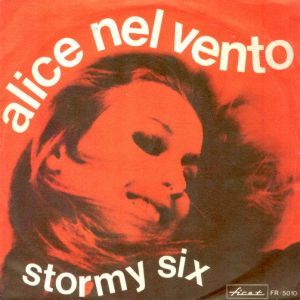 Two other songs on the single were credited to Stormy Six but not played by them, and it also included a popular Anna Identici song. 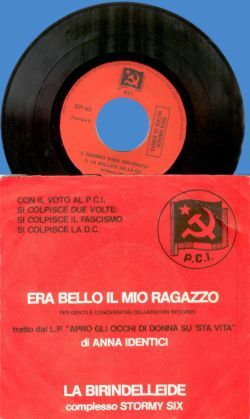 A similar single has been released by Equipe 84 for the PSI (Partito Socialista Italiano, Italian Socialist Party) in 1975. 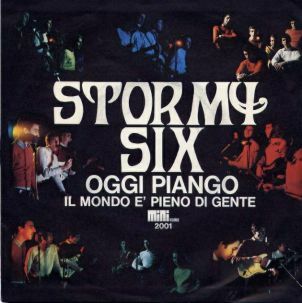 Around 1973 Stormy Six collaborated with Milan's Student Movement for some singles produced by the movement's own label: the first one was a four-track EP with two songs, Dimitrov and Palestina performed by the group (the other songs are I padroni possono perdere la testa and Come Yu Kung rimosse le montagne, cat.no.MS 003), the second was a single credited to Commissione Artistica del Movimento Studentesco Milanese that contains Compagno Franceschi and E se il nemico attacca (contro ogni opportunismo), cat.no.MS 004. 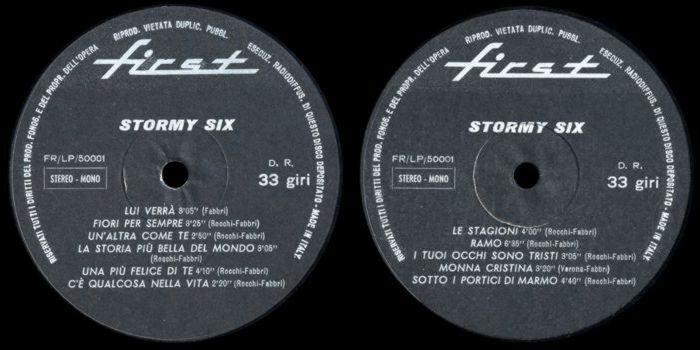 A third single credited to Movimento Studentesco Milano contained two songs written by Umberto Fiori, Chi ha ucciso Saltarelli? and Un bel discorso fine e antifascista and Franco Fabbri may have played on it. No counterfeits nor other foreign issues exist. 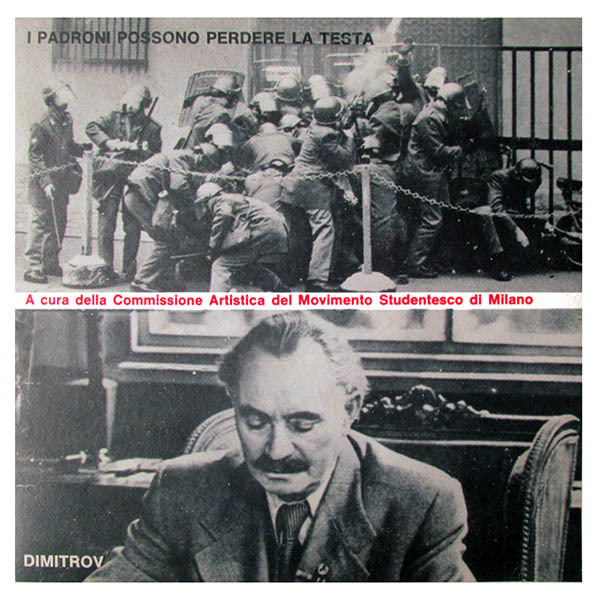 Le idee di oggi per la musica di domani - LP and three different labels, First standard (13 tracks), First alternate version (11 tracks in different order), Ariston. Guitarist Franco Fabbri has written a sort of autobiography, Album bianco (see the Books section for details), that offers a very interesting view on the Italian 60's and 70's rock scene. Fabbri also has an Internet website at www.francofabbri.net, which also contains information on L'Orchestra. Many thanks to Franco Fabbri for friendly help and plenty of information. Also thanks to Alessandro Pomponi from Rockground, Fabiano Petrone, Peppe Carrese and Ubaldo Cibei (Franco), Luciano Fassa, Claudio Bellanti for some information and scans in this page.